Once upon a time, in Chinatown, I had these funny little cakes filled with mango or peanuts. They are gluten-free, rolled in coconut, and funny. They have a weird texture, delicious and kind of gummy and odd. But they are delicious. It never occurred to me that I could make them myself. But I was reading the side of the Mochiko sweet rice flour box, and there is a recipe for chocolate mochi. I started looking around the internet, and found out that the little cakes I love are also called Daifuku. And they are really simple to make. Most recipes I found are filled with red bean paste, which I don't particularly like, and don't have on hand. I saw some filled with fruit and bean paste, but I just filled mine with fruit. I can't eat raw fruit, but for some reason I can eat frozen fruit (it has something to do with the processing). Alex got me some frozen, cubed mango, and I used those for the filling. They only took about 20 minutes, and are pretty delicious and surprising. Stir together the tea and sugar, microwave 30 seconds or a minute until sugar is dissolved. Stir in rice flour, cover loosely with plastic wrap, and microwave for 3 minutes. While mochi mix is microwaving, combine cornstarch and sugar and liberally dust your cutting board, set fruit nearby, and get out a spoon. Stir mochi mix, then cook 2 more minutes. Carefully turn out onto dusted surface (mochi will be hot!) and dust your hands with sugar-starch mix. Break off a quarter-sized piece, flatten it out, and put a piece of fruit in the middle. Pinch the sides up and seal, and repeat, working quickly so the mochi doesn't get too cold. 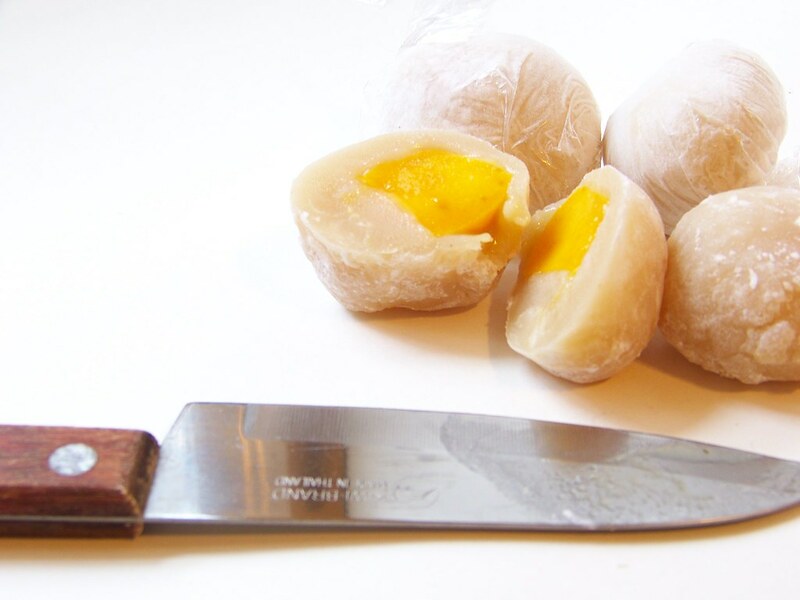 Once finished, wrap up mochi balls individually tightly. Keep in the fridge or freezer. I can't wait to try this recipe! My sister also can't eat raw fruit. 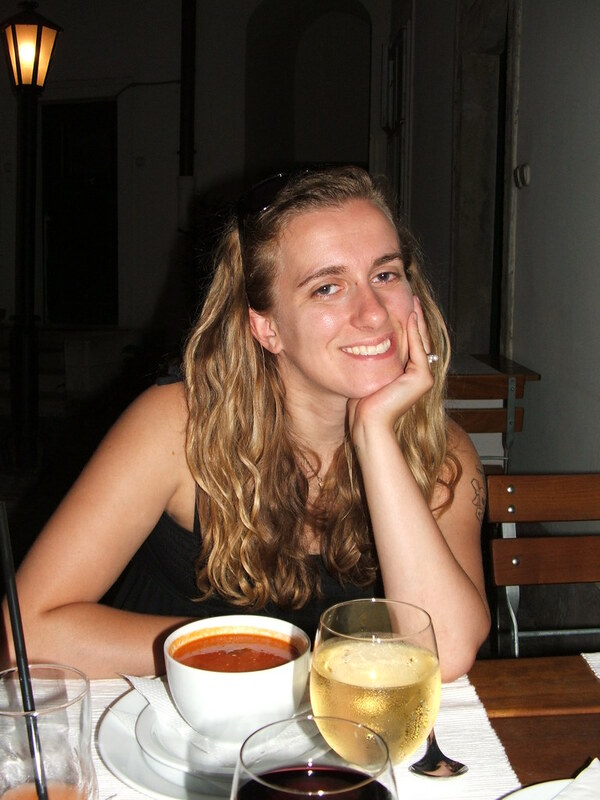 She has a pretty interesting food allergy to a type of protein that usually goes away with processing. Marlow - Hm, I've never had a doctor be able to tell me exactly what it is in the raw fruit that I can't have, but it's a developed allergy. One day I bit into a peach, and oops! Tongue swelled up. I wonder if it's the protein? I've never really looked much into it. at first glance, i thought it's boiled eggs! I love mochi but the only time i made it, it turned out to be a disaster. Yours look perfect! google recipes for 'daifuku recipe' and a few will come up! Mandy - The microwave way is easy, and pretty quick! Thanks! Those funny little cakes were so good! Maybe I should try to make this. Or twinkies. Or both. Mochi! I LOVE mochi! After my trip to Taiwan, I made some of my own but never posted about them. You have inspired me to re-make them. I love mango middle -- great idea. You're lucky to be able to eat peeled fruit! What a weird, more common than I thought, allergy! And I'm so jealous you went to Taiwan! Mango and mochi sounds like a nice combo! anyways, my husband also has the fruit allergy you have- it's called oral allergy syndrome or pollen food syndrome (http://en.wikipedia.org/wiki/Oral_allergy_syndrome) or (http://www.beyondallergy.com/food-allergies/oas.php) these sites describe it well. he usually just takes a benadryl when it gets too bad, but it depends on the type of fruit in terms of the severity (apple, peach, nectarine, cherry, plum, etc.-not citrus or berries). anyways, it's interesting that since it's pollen related, he was able to have apple in another country that he hadn't had in 15 years and not get a reaction (although i'm not encouraging experimentation :)) but peeling the skin doesn't make a difference because the pollen is inside the fruit, but cooking it is able to change the molecules. anyways, feel free to stop by my blog- i'll be back to yours! My goodness these look amazing for such a simple thing. I think I could add these to my holiday cookie tray and no one would be wise to their gluten-free nature... perfect! Yep - Oral Allergy Syndrome is actually pretty common and immunotherapy (allergy shots) will stop it and some people can just use over the counter allergy medicine to treat it since it is actually a pollen-related allergy (your body gets confused between the proteins in the fruit and a pollen to which you are allergic so stopping the reaction to the pollen also stops the reaction to the fruit). The fruits that cause it in you are related to your particular seasonal allergy. It's also usually worse when the particular pollen you are allergic to is in the air. Cooking or freezing denatures the proteins so you can eat the fruit. Does eating Mochi remind anyone else of kissing? The soft, powdery Daifuku is like one big fat luscious lip. I love mochi, finally a recipe for it... thanks so much! I was reading other articles about Mochi, and yours is the one with the most interesting recipe and information. Thanks for sharing and have a nice day. Very interesting post... something really informative... I wish to read something like this again... we keep coming back to your blog..